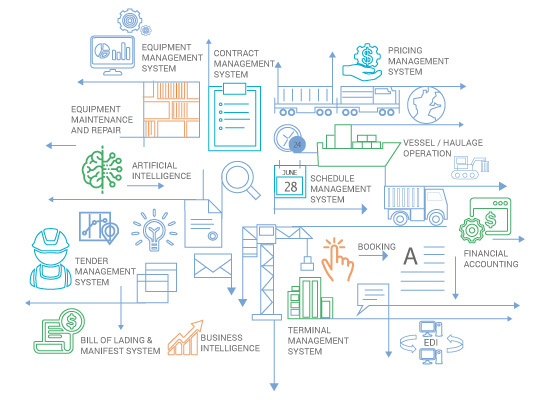 The Liner/NVOCC shipping companies are constantly focusing on ERP (Enterprises Resource Planning) solution to increase margins, robots control to improve operational efficiencies, Business Intelligence insights to provide better visibility on the analytical solution and accurate shipment details to the customers globally. SVM ERP – V2 is a streamlined, automated, web-enabled integrated ERP Solution, designed to help container shipping lines to gain unprecedented visibility in their global operation whilst optimizing asset utilization and minimizing cost. SVM ERP (Enterprises Resource Planning) embraces advanced optimization algorithms and machine learning techniques to prescript best solutions for complex operational problems, aid quicker and informed decision making. Responsive web application with enhanced user experience, accessible anytime and in any device. Widgets to provide better visibility insights and roles based right slices of Data to monitor operation process flow made ease. Re-Optimize your operations real-time demands with improved customer responsiveness. Extract insights from your own data with a customized view and an option to download in xls & csv format. SVM ERP – V2 is available in the Cloud or on-premises.